Situated on a private beach on the sparsely populated Tioman Island, the 4-star Berjaya Tioman Resort is 5 km from Tioman Marine Park and 7 km from Kampung Juara Beach. This tropical hotel has 6 full-service restaurants featuring Malay and other Asian cuisine, as well as poolside and beachside bars. A golf course, spa, outdoor pool, and cyber-café are also on-site. Order room service and look out to views of the sea, hillsides, or rainforests while sitting in guestrooms that feature natural wood accents. Rooms also come with free WiFi and satellite TVs. Berjaya Tioman Resort’s bars, restaurants, and recreational activities all take full advantage of its tropical, private beach location. Guests are offered a buffet breakfast each morning. Sri Nelayan is also open for breakfast, lunch, and dinner, and offers Malay cuisine and scenic patio dining. Experience Thai and northern Indian dishes at Coriander Seeds Restaurant; guests in the mood for Chinese fare can try Fortune Court (both restaurants are open for dinner only). The unique sunken-pool and beachside bars serve refreshing cocktails throughout the day and night. Visitors can enjoy a round of golf with the South China Sea and island rainforests as a backdrop at this 4-star resort’s 18-hole course. There’s also beach volleyball, a basketball court, and a night-lit tennis court. On warm afternoons, guests can take a dip in the outdoor pool, or unwind with a massage or body wrap at the full-service spa. A cyber-café has computers, free WiFi is available throughout the property, and several meeting and banquet rooms can accommodate most events. Sri Nelayan - This coffeehouse-style eatery with patio seating offers Malay cuisine throughout the day. Matahari Restaurant - This beachfront Thai restaurant is open for dinner only and requires reservations. Start your day with a free buffet breakfast, available daily from 7 AM to 10:30 AM. Every day, the resort hosts a free manager's reception for you to enjoy. You can order a meal from room service during limited hours. 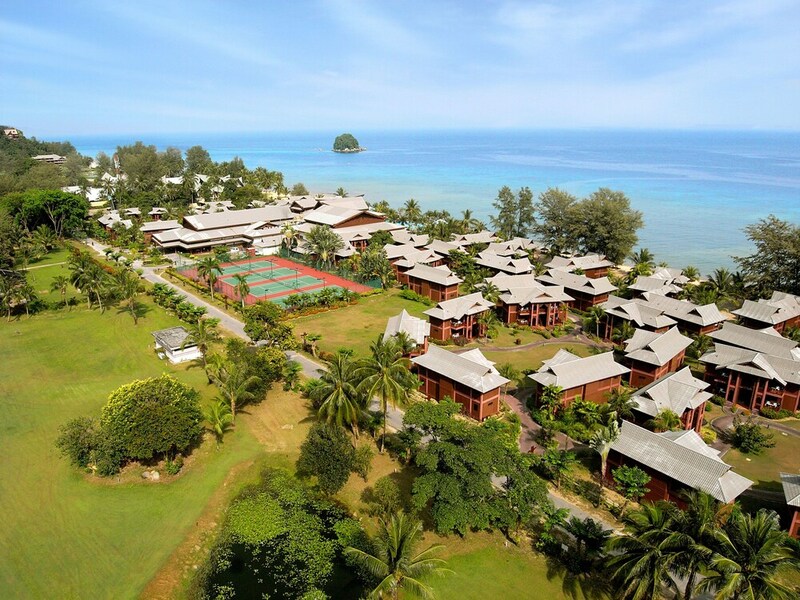 Berjaya Tioman Resort features an 18-hole golf course with sweeping views of the South China Sea and rainforests. The resort’s outdoor pool has a poolside bar, and there is also a children's pool. A tennis court (with night lighting), basketball court, and beach volleyball are located onsite. A fitness center has cardio and weight machines, as well as a sauna. Hotel staff can also arrange diving excursions or jungle treks nearby. Guests can treat themselves to a half-hour or half-day at Ayura, the resort’s full-service spa. Visitors enjoy massages, body wraps, facials, manicures, and pedicures. Aromatherapy treatments are also available. 5 hours from Kuala Lumpur to Mersing, Johor and then 1 hour 30 minutes from Mersing Jetty to Tioman Island by fast ferry. 5 hours from Kuala Lumpur to Tanjung Gemok, Pahang and then 2 hours from Tanjung Gemok Jetty to Tioman Island by fast ferry. 3 hours 30 minutes from Singapore to Mersing, Johor and then 2 hours from Mersing Jetty to Tioman Island by fast ferry. 4 hours from Singapore to Tanjung Gemok, Pahang and then 2 hours from Tanjung Gemok Jetty to Tioman Island by fast ferry. 3 hours from Kuantan to Mersing, Johor and then 2 hours from Mersing Jetty to Tioman Island by fast ferry. 2 hours 30 minutes from Kuantan to Tanjong Gemok, Pahang and then 2 hours from Tanjung Gemok Jetty to Tioman Island by fast ferry. Please contact hotel for the latest Ferry Schedule and seats availability. For more details, please contact the property using the information on the reservation confirmation received after booking. Rollaway/extra beds are available for MYR 145.0 per day. Book a stay in a "Junior Suite", "Garden View Chalet", "Sea View Chalet", or a "Beach Chalet" for travel March 1-April 30, 2019 and receive a 1-hour bicycle ride. Must book specified room type to receive benefits. Full details at check-in. Offer subject to availability. Offer is not valid with groups/conventions and may not be combined with other promotional offers. Other restrictions and blackout dates may apply.